Flow Cytometry Facility provides the campus research community ready access to analyze and sort live cells or other particles (biological or artificial) based on their optical properties. Flow cytometry instruments measure the characteristics of cells as they flow in the suspension, in single file, through an illuminated volume. 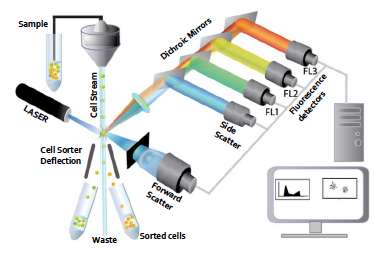 Scatter and autofluorescence can be measured, and fluorescencent dyes can be added to measure other characteristics. For particle analysis, we provide campus researchers instruments conveniently located around campus in our satellite facilities (Burrill Hall, Morrill Hall, DCL, and RAL) as well as in the main facility (231ERML). These bench-top analyzers are available to trained users 24/7. Our sorter, located in 231ERML, is operated by facility staff and available during regular business hours Monday through Friday, from 9-5 p.m.